​In 2016, the Supermarine Spitfire celebrated its 80 Anniversary since the first flight on 5 March 1936. The first that comes to mind regarding the title of the book are the 50 Vickers Armstrong Spitfire P.R.Mk. XIX Type 390 that operated by Flygvapnet as reconnaissance airplanes at Wing F 11 between 1948 and 1954, designated S 31. That particular chapter of course forms the main part of this book. However, there are other interesting Swedish Spitfire connections. Among those are the crash in Harjedalen Provence of a Spitfire P.R. Mk. IV in May 1945, the visit by a Royal Norwegian Air Force Squadron to Wing F 4 in 1950, the purchase and restoration of the Flygvapenmuseum's Spitfire P.R. Mk. XIX, the many appearances at Swedish air shows from the mid 1980's by British owned Spitfires, the Spitfire Mk. XVIe and Mk. XVIIIe obtained by the car utility parts company Biltema, and last but not least, the ongoing restoration to airworthiness of Spitfire P.R. Mk. IV (BP923) in Stockholm. The Spitfire is a living legend. This book is hard cover of 208 pages in 8 1/4" x 11 1/2" page format. The pages turned side-ways so that they are 11 1/2" wide. 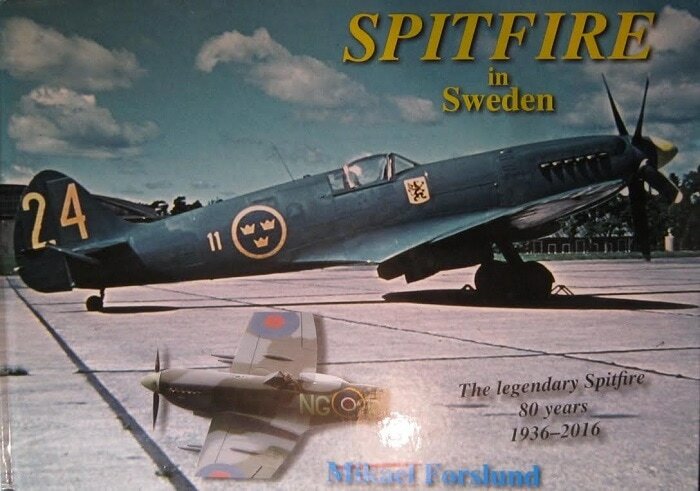 The cover shows a Spitfire in Swedish markings with a yellow 24 on the rudder, a small yellow 11 next to the fuselage roundel (also in yellow) and a yellow shield with a black griffin on it under the windscreen. Below this is a photo of Spitfire in British markings with the fuselage code of white NG roundel D. This photo just shows a small part of the aircraft. The back cover of the book has a color photo of this same aircraft in flight. The caption below it says that it is Biltema's Spitfire Mk. XVIe with pilot Par Cedergvist over Mora-Siljan airport, 29th July 2010. Photo by the author. The book contains 500 photos, both Black and white and in color. There are 19 color profiles and tons of tech data in the book. Many photos of various individuals related to the story. This is a very interesting book about the commemorative celebration. I want to thank the folks at Casemate who sent me this review sample. Casemate is a distributor based in Pennsylvania that handles many different publishers.